I'll be honest, there are so many nail polish brands out there that I honestly haven't heard of all of them. When I received this email from LAQA & Co., they mentioned their polish pens... and the only polish pens I could think of were the Nicole by OPI Nail Slicks that I had bought a bunch of, and never used. I personally was having trouble with the way the polish flowed. However, in LAQA & Co.'s email, they were letting me know that now they have bottles too! I'm a much bigger fan of bottles (my OCD loves it) and even better, LAQA & Co features unique artwork from young designers who are looking to get their voice out there. They receive part of the profit from their colors that are purchased. They also had a cute gift box line for this holiday season and it's still available - hello, Valentine's Day gifts anyone? 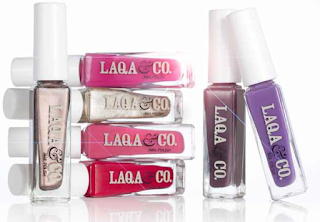 Please enjoy the following release - all images courtesy of LAQA & Co.
LAQA & Co. has taken their quick-drying glossy nail polish formula and put them in a sleek bottle! The range includes all Fall’s hottest colors, along with new shimmering metallics, perfect for a subtle holiday look. And as usual, we’re supporting young artists by covering our packaging in their unique artwork. And they get a cut of the profit from every pencil purchased.